Artph 340 Alternative process course covers non-traditional photographic processes. 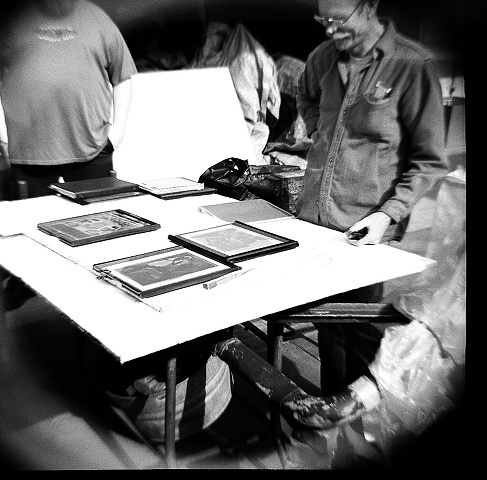 This course covers photographic printing processes produced in sun- light. No camera is necessary. Processes such as kallitype, cyanotype, Van Dyke brown printing, and gum printing are covered. It includes the history of photographic processes from the daguerreotype to the digital age. Negatives are produced from digital transparencies, xerox transparencies, ortho-litho film and natural objects. Printing on pa- per, fabric, wood and ceramics is covered. Papers and printing sur- faces, brushes, memory storage devices and safety glasses are required. Field trips may be required. Different topics, artists, and processes are covered each semester. This course may be taken twice for credit.